Memorial Day weekend is the unofficial start of summer, when Americans head to the woods, beach and back yards to get fresh air and sunshine and shed the dreary winter blues. I went to Vermont. Out for a hike along a river with Gabe, we came upon a wide mountain stream gushing white water down a rocky slope. The stepping stones had been pushed away over the winter and we wanted to cross. After several minutes of contemplating the next step, Gabe decided to step on the one good stone available. With the left foot planted on the rock he brought his right foot up and placed it next to his left foot. He then stood up very slowly to get balance and his right foot went right into a rock crevice of gushing ice cold mountain water. I decided to take my boots and socks off and walk right into the cold water. The air was cool and the sun was unaware of the holiday weekend. My feet were cold just standing on the damp forest floor. I plunged my right foot into the stream and yelped out loud then I placed my left foot into deeper water and stood still to get balance. The icy cold water made my body stiffen up and reminded me I am still alive. I took the next steps slowly and without hesitation and said to myself, “I will survive”. 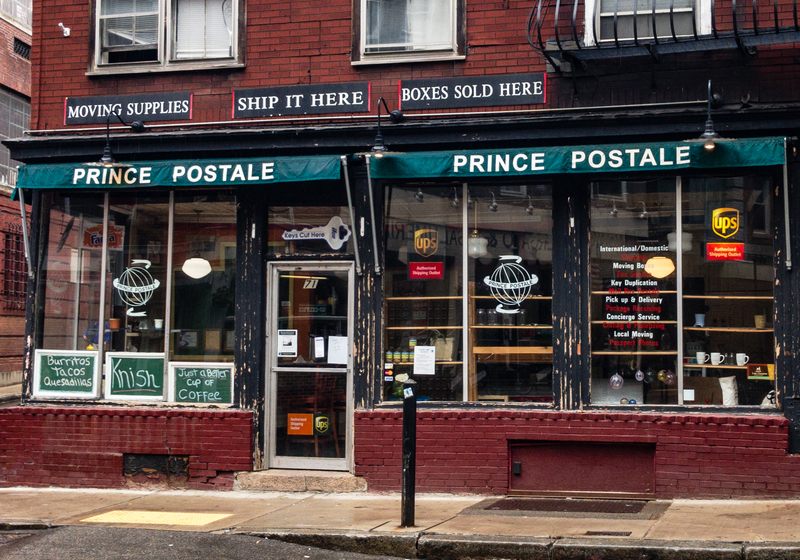 The rumors are true; Prince Postale is closing for good. I will survive, so will the neighborhood. I took a step at operating my own store and faced more obstacles than a mountain stream. I went in with both feet and never bothered to look for a stepping stone or walking stick to help me navigate my uncharted path. I failed at the books and the finances, but succeeded beyond imagination at providing services, making connections, solving problems and being there for a community I love. My little shop on Prince Street touched the World – literally. The rumor of my closing has been heard in Brazil, England, Germany, Spain and even New Jersey without me announcing anything to anyone. For that fact, I am a success. I have shipped to every continent except for Antarctica. I have shipped a Christmas tree to Arizona. I have shipped my burritos to western Massachusetts. I have wrapped and packed two original Picasso’s. I have built crates for MIT and Harvard. I have made contacts around the world and around the country. I have made doughnuts and crumb cake to near perfection. I have cut a lot of keys. I have dealt with the FBI, Homeland Security, state and local police and the US Postal Police (Mailbox holders). I have intercepted packages, rerouted packages, held packages and thrown out packages. I have given direction to the corporate pizza chain restaurant more than I would have liked. I have washed out cuts, provided band aids, pumped up basketballs and soccer balls, as well as bicycle tires for all the kids in the neighborhood. I have received hundreds of thank you cards and notes over the years, and I have all of them. I made more people smile than frown. I want to thank everyone that has expressed their thoughts and gave me hugs on how I made a difference in their lives and in the neighborhood. I am humbled by the kindness and caring comments. What is next for me? Good question. What is next for this location? Not my question to answer or even speculate. My landlord has been extremely good to me by allowing me the opportunity to be on Prince Street. I am forever thankful. Next articleWednesday’s Guide: Mayor’s Coffee Hour, ‘Skinny House’ Sold, Top Lobster Roll? Oh John, we will miss your store…..big loss to the neighborhood. We’re glad you’ll still be around. Better things are coming next my friend!! You helped make the north end feel like home for a family that had just moved across the country, you helped a Mom in a pinch with a stroller full of groceries and her wallet at home, you were a friendly face every morning on the way to school, you helped a little boy feel special with an Italian ice on his preschool graduation day, you sent a dose of our beloved Boston down to Texas. You, Gabe, Chica, and Prince (rest his soul) will be greatly missed. Thank you for everything! Great shop and great owner. Sorry to hear your are closing John Best of luck with whatever you do next. Sad to see you go. Change for many of us is tough but we appreciate your presence in our little neighborhood for as long or as short as it was! I wish you and kitty well whatever the next adventure! We are so sad to hear you are closing but excited for the next steps in your life. I know everything you do you will make a success! I hope to see you around the neighborhood! Tom Damigella. I always thank you for your kindness when I asked you to check on my dad who was living at Noyes Place. I wish you the best. You were a special part of the North End. I hope to drop in soon and personally wish you the best. Prince Postale is a big part of my study abroad at North Bennet Streets School. All great burritos and sweets made me keep building furnitures. maybe because I could chat with both of you and friendly customers pretty much everyday. I wish you the best for next step and good health. Sunday while waiting for my husband,I noticed a girl with a package knocking on your door. Obviously no one was there… I called her over and notified her that you were closing for good. I wish I had videoed her face.. she was instantly confused and sad. “Oh, no!” Was her reply… “what will we do without Prince Postsle and John.” This is how we all feel. This corner of Prince without Prince Postale???? Unfortunately (in this case) change is constant. Only in the north end (in a major city) you could burritos, coffee, bagels and donuts while getting a key copied and a package shipped. I’m sure we’ll get some looks (kind of like trying to explain a pay phone to a young child), but for that brief moment in all of time, we had the pleasure of experiencing what future residents won’t. That few can claim.May the next chapter bring you peace and joy. This breaks my heart. You are truly one of the special people that make the North End what it is. After the first time I came in you made me feel like a regular, recognized and remembered, you’re a unique person. Somewhere is about to receive a great addition. It’s only a tragedy that their win is out loss. The shop will be missed, hopefully you won’t. John thanks for everything you did for me while living in the North End. You are such a hard worker and I wish you and Gabe nothing but the best. So upset to hear from Gabe that you were closing! I kind of hoped against hope it wasn’t true. Thanks for being here. You guys really helped make this place feel like home for me. And thank you for helping me with my lock issue last month (Charter Street)! My Prince cat ornament will be on my tree every year. John and Gabe, thanks for being true members of the North End community. Thanks for dealing with my almost-daily Amazon habit. Thanks for cutting us emergency sets of keys when we needed them. Thanks for amazing breakfasts. Thanks for the Christmas trees. Thanks for giving me Prince Postale coffee mug that one time ‘just because.’ Thanks for the laughs. Thanks for everything. Please don’t be strangers. See you around the neighborhood. So sad to hear the news. I hope you remain in the neighborhood . You are so much a part of this community. Much luck in yoyr future endeavors. Big loss for the neighborhood! Thank you for helping the North End library with so many tasks over the years. Thank you for delivering an awesome Christmas tree every year to our home! You will be missed! Best of luck to you John – thanks to you, Gabe, Prince, and Chica for being such valuable members of our community. Oh John So sad to see Prince postal closing. You are my go to store!! Thank You for all you have done for me and of course our North End neighborhood Wishing you all the best of Luck, Good Health as you journey to your next endeavor.